The northern coast of Colombia, at the boundary between the Caribbean plate and South American plate, is an area rich in various geological objects: granitic massifs, metamorphic rocks, major strike-slip faults, accretionary prism... The history of this boundary is complex and subject to numerous interpretations. I am particulary interested in the reconstruction of the geodynamic context at ca. 60-40 My with the emplacement of the Santa Marta massif and the more recent kinematics of the adjacent Bucaramanga and Oca faults, as well as the intriguing Bucaramange nest (cluster of intermediate-depth seismicity), in relation with the particularly elevated topography. Place the cursor on the photo to display seismicity. SM-B: Santa-Marta - Bucaramanga fault. Map adapted from Cortès and Angelier, 2005; Kammer and Sánchez, 2006; van der Lelij et al., 2010; Mora et al., 2010; GPS motions from Trenkamp et al., 2002; topography from GMRT model; earthquakes from IRIS browser (newer events). Jiménez-Diaz G., Bajolet F., Faccenna C., Rosseti F., Speranza F. Emplacement of the Early Eocene Santa Marta batholith (Santa-Marta Massif, northern Columbia): Constraining the Cenozoic tectonic evolution of the Caribbean arc, in preparation. Here, I present an extract of the map of the Bestiac massif (adapted from de Saint Blanquat, Bajolet et al., 2016) completed with numerous photos (click the "information" points!) to illustrate the variety of rocks and features found in this area. On the field, the peridotite (lherzolite) appears in orange/red hues due to alteration, or in green colors when it is altered in serpentinite. The marbles/carbonates are in grey colors. The detailed mapping of this km-scale site where peridotites outcrop on the footwall of the North Pyrenean Fault (the main frontal thrust of the Pyrenees) showed that they are organized in plurimetric to plurihectometric lenses elongated in the EW direction. The amount of alteration is very variable, lenses being constituted by fresh peridotite where the magmatic foliation is still visible to totally serpentinized peridotite. Contacts are often characterized by breccias with both marble/carbonate and peridotite clasts. 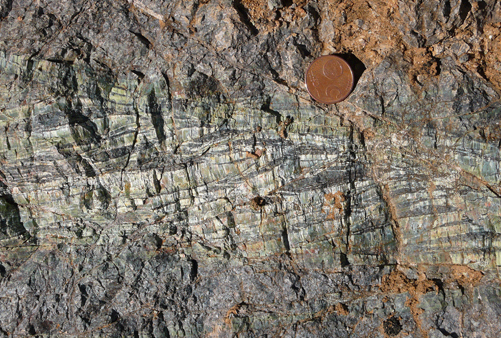 Some breccias contain peridotite clasts showing various degree of serpentinisation, hence coming from different sources, and some breccias are organized with layering. 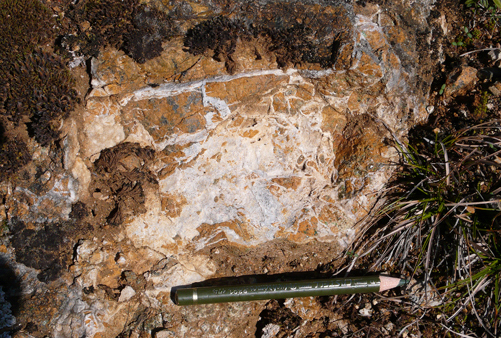 Magmatic foliation in lherzolite underlined by ferromagnesian minerals (left picture) and marble breccia (right picture)(hover the mouse on the photo for interpretation). Breccia with lherzolite clasts in calcitic matrix arranged in sedimentary bedding (hover the mouse on the photo for interpretation). Contact between marbles and lherzolite with carbonate-filled fractures. Several generations of carbonate and serpentinite veins inside a fracured lherzolite. Contact marbles-lherzolite (view toward the W, left picture) and close view of the contact with polymictic breccia (right picture)(hover the mouse on the photo for interpretation). Polygenic breccia with marble and carbonate clasts. 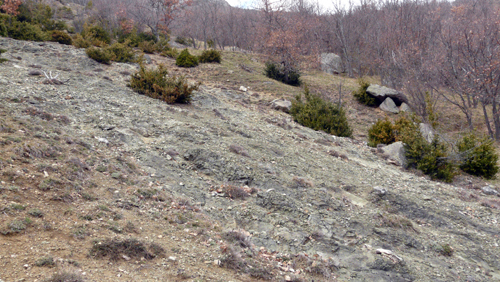 The marbles outcroping along the road in the southern part of the massif are within the cataclastic zone of the NPF and display several brittle faults planes. 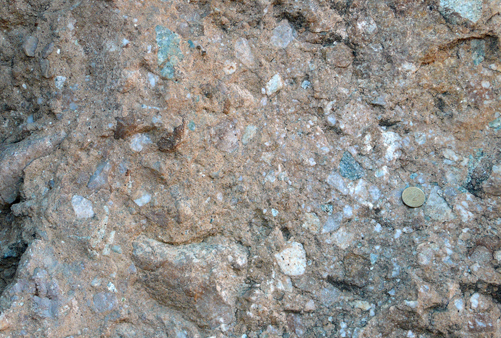 General view toward the north (left picture), marbles embedded in lherzolite (top right) and lherzolite boulder embedded in marbles (bottom right)(hover the mouse on the photo for interpretation). Marbles/lherzolite contact, direct or separated by breccias (hover the mouse on the photo for interpretation). 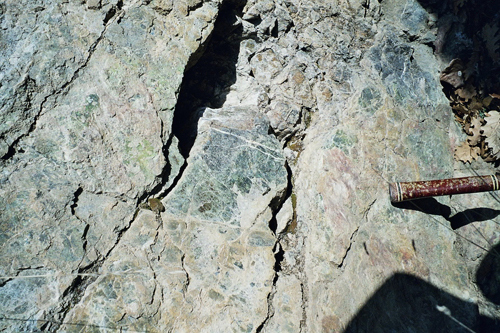 Stratificated breccia with lherzolite clasts (hover the mouse on the photo for interpretation). 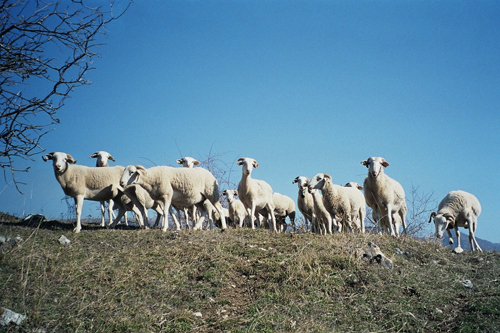 Field fellows (avidly waiting a share of my meal). 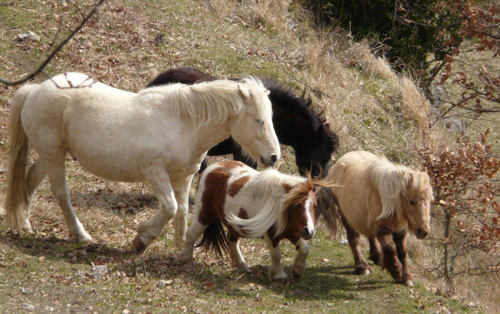 Field fellows (almost as wild as untamed mustangs).